But they do make one hell of a movie. You’re going to read a lot of retrospectives this year about how Casablanca is, perhaps, the greatest film of all time. I’m firmly in that camp, with a few caveats. But that’s another essay for another day. This essay is about the three elements that make Casablanca so great. Not coincidentally, they are the three elements every author should strive for in their own work: Story, Character and Dialogue. “With the coming of the Second World War, many eyes in imprisoned Europe turned hopefully or desperately toward the freedom of the Americas. Lisbon became the great embarkation point. But not everybody could get to Lisbon directly. And so a torturous, round-about refugee trail sprang up. Then by train or auto or foot across the rim of Africa to Casablanca in French Morocco. Here the fortunate ones – through money or influence or luck – might obtain exit visas and scurry to Lisbon, and from Lisbon to the New World. That’s the broad outline of the story, told neatly and succinctly. Your novel should open the same way. The next hour and 42 minutes focus mainly on “the problems of three little people,” Rick, Ilsa and Victor. Rick is played by Humphrey Bogart, in what many argue is his greatest role. Ilsa is played by the stunningly beautiful Ingrid Bergman. 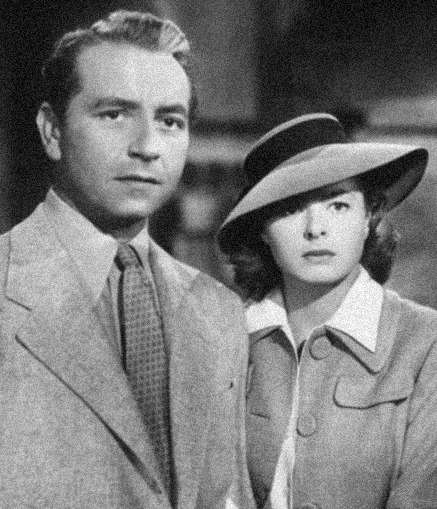 And Victor is played by Paul Henreid, who fled the Nazis in real life because he was a Christian married to a Jewish woman in 1930s Germany. The plot, a microcosm of the opening dialogue, is simple: Victor and Ilsa are trying to get to America. They need Rick’s help to get there. Rick is no fan of the Nazis, but he’s blinded by his bitterness over his failed relationship with Ilsa. That’s it. It’s a simple story made better with great characters and great dialogue. When we first meet Rick, he is playing chess with himself in the private gambling room of Rick’s Café Americain, the very popular “saloon” he runs. A long, panning shot from the door to the back room gives us a real flavor for the place. Women dressed in evening gowns and diamond earrings. A full orchestra playing 1930s American standards and jazz. We get to eavesdrop on snippets of conversations in the café: a woman trying to sell diamonds in a market awash in diamonds; a profiteer arranging an illegal boat passage to Lisbon; some Japanese agents speaking quietly in a corner. Contrast this with our first glimpse of Rick, and you begin to understand that he’s an aloof loner. To further drive home the point, a wealthy gambler at one of the tables asks the head waiter, Carl, if Rick will have a drink at their table. Yes, he sits alone. Dressed in a white dinner jacket and black bowtie, an ashtray full of half-smoked cigarettes and what looks like a martini glass at his elbow, and a cynical scowl on his face. When Abdullah, the casino doorman, looks over at Rick, he shakes his head when he recognizes a German banker at the door. Our first clue that maybe there’s more to this Rick than meets the eye. When Rick meets the banker at the door, he is incensed. “Your cash is good at the bar,” Rick tells him as he rips up his calling card and dismissively tosses it on the floor. The man walks away in a huff, promising to report the incident to the police. Little does he know that Inspector Renault, the chief of police, is one of Rick’s best friends. We next meet Ugarte, played perfectly by Peter Lorre in one of the great cameos in all of film. Ugarte is one of the many blackmarketeers praying on refugees in Casablanca. He asks Rick to hold onto Letters of Transit for him that he plans to sell in the café that night. They are the golden passport out of Casablanca. This is a key plot point, but Ugarte is also another of the film’s many foils, an interesting character here simply to move the story along and tell us more about Rick. Rick also sits down with Signor Ferrari, another Casablanca saloonkeeper who also dabbles in the black market. Ferrari, played with aplomb by the great Sidney Greenstreet, is, like Ugarte, another foil to give us more insight into Rick. Ferrari asks Rick if he wants to sell the bar. “What do you want for Sam?” he asks, referring to Rick’s black piano player and the star of the café’s floorshow. Stop and think about that bit of dialogue for a second. Not in 2017, but in 1942 in a blockbuster Hollywood release. Jim Crow was still very much alive in the South, with lunchroom counters, washrooms and train cars still segregated. Yet, when asked how much he’d take for a black piano player, Rick delivers that line, showing again that there’s more to him than his gruff exterior. We get yet one more piece of the Rick puzzle when we learn that he is especially cynical when it comes to women. Yvonne, one of the local girls, is waiting for him at the bar. 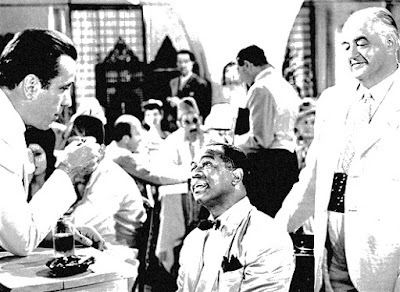 After Rick has a tipsy and angry Yvonne escorted to a cab, he sits down on the patio for a smoke with perhaps the one person more cynical than himself about life and death in Casablanca, Inspector Louis Renault, the chief of police, played by Claude Raines. As a plane takes off and flies over the bar, both look up. “The plane to Lisbon. You’d like to be on it?” Louis asks Rick. 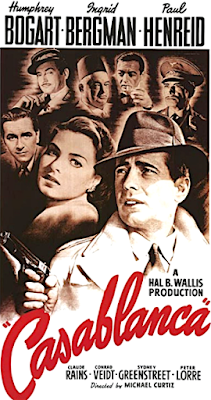 After telling Louis that “it’s a combination of all three,” he learns that Victor Laszlo, the famed anti-Nazi Resistance leader, is coming to Casablanca, looking for passage to America. Louis, unaware that Rick has Ugarte’s Letters of Transit, warns Rick off helping Laszlo. “I thought it was because I let you win at roulette,” Rick deadpans. Fast forward, and the plot thickens. “I think not,” Rick says. I could go on, but I’m not going to analyze every scene, frame by frame. 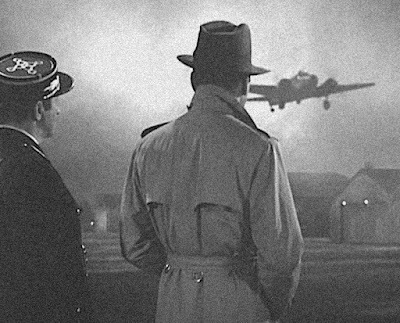 The reason, plain and simple, that Casablanca works so well is that it’s a great story, with good character development, aided by well-written dialogue. There are more great lines in this film than perhaps any other. I especially like the dialogue between Rick and Major Strasser, the German officer who has been sent to Casablanca to stop Laszlo. “Make it official if you like,” Rick says matter of factly. “I was born in New York City if that’ll help you any,” Rick says after the laughter dies down. “There seems to be no secret about that,” Rick says. Again, that’s just great writing. We learn later on in the conversation that Rick has helped underdog causes in the past, namely loyalists in Spain and as a gunrunner to Ethiopia during its war with Italy. My favorite line of the whole conversation – perhaps the entire film – is when Rick is looking over the dossier that Major Strasser has on him. “Are my eyes really brown?” Rick asks. Of course, it would be wrong to talk about the greatness of Casablanca without discussing the romance that drives some of the plot. The romance that was – and in some ways very much still is – between Rick and Ilsa. Rick sits alone at a table. There is a glass of bourbon on the table directly in front of him, and another empty glass on the table before an empty chair. Near at hand is a bottle. Rick just sits. His face is entirely expressionless. The beacon light from the airport sweeps around the room creating a mood of unreality. Sam, the piano player, comes in and tries to console Rick. Tries to get him to run away from Ilsa. But Rick will have none of it. “She’s coming back,” Rick says between gritted teeth. “I know she’s coming back.” Bogart is superb as the scorned lover. Thoroughly morose, but he takes a certain satisfaction in wallowing in it. This is not only great dialogue, but another example of the subtle political commentary sprinkled throughout the script. Like Ferrari’s comment about isolationism, the idea here is that in Casablanca and the rest of Europe and Africa the people are having to deal with the Nazis. Meanwhile, back in isolationist America, still reluctant to enter the war in December 1941, presumably before Pearl Harbor, everyone is comfortably asleep in their beds. Then Rick pounds his fist on the table and utters perhaps the most famous line in the film. Rick pours himself another, and we see his whirlwind Paris romance with Ilsa in flashback scenes. Rick and Ilsa on a boat on the Seine, feeding seagulls. Driving through the French countryside in a convertible. Dancing cheek to cheek to an orchestra late into the night. And, finally, Rick and Ilsa drinking champagne with German cannon fire “getting closer by the minute” in the distance. Rick and Ilsa make plans to catch the last train out of Paris to Marseilles. They talk about getting married, but it’s clear Ilsa is uneasy about that. After she breaks down, telling Rick that they picked a horrible time to fall in love, she tells him she’ll meet him at the train station. Of course, she never shows. She does show up at the café later that night, to ask Rick to help her and Laszlo escape to America. “I saved my first drink to have with you,” he tells her as he pours another tall one. With one look at the bottle, Bergman’s Ilsa tells us that she realizes he’s drunk…and bitter. “How long was it we had, honey?” Rick asks her. I could go on. There are so many great lines, and so many great scenes, all delivered and played by actors who portray their characters to a tee. In short, I don’t care if it’s 75 years old or 75 hours old, this is a great story. The lives of three people, each with their own agendas and grievances, set to the backdrop of World War II. But as I said at the start, Casablanca works because it has the three main elements that every work of fiction must have: Story, Character and Dialogue. And all three are masterfully woven into this film, perhaps better than any other ever made. 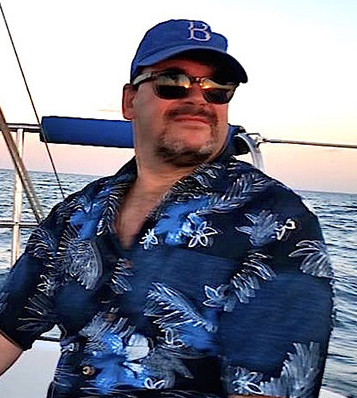 Mark Yost is a regular contributor to Stay Thirsty Magazine and The Wall Street Journal and is the author of five novels in the Rick Crane Noir mystery series.